Come June 30, Keith Smith’s last official day as director of Ohio State University Extension, you will find him on campus bright and early, riding herd over a series of business meetings and sporting his signature cowboy boots. OHIO EXTENSION LEADER RETIRES – This cowboy isn’t riding into the sunset. 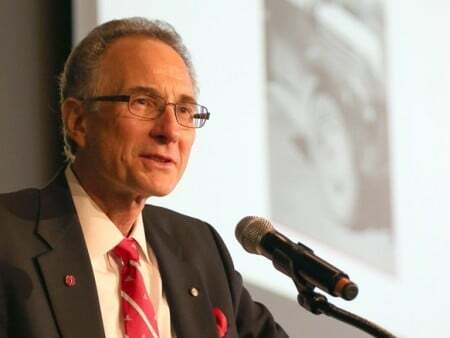 Smith retires after 35 years at The Ohio State University, 23 of them as head of Extension. Leading up to his last few weeks in office, he showed no signs of slowing down. “Keith has led the organization through significant growth and has been a steady guide all the way through his final days as director, as the organization continues to adjust to rapid, societal changes,” said Bruce McPheron, Ohio State’s vice president for agricultural administration and dean of the College of Food, Agricultural, and Environmental Sciences. Extension is the college’s outreach arm. “Ohioans, and indeed individuals across the country, will benefit from Keith’s leadership for years to come,” McPheron said. Smith said his successor will inherit one of the top Extension organizations in the country. “The faculty and staff are eager to be creative and innovative. They are in constant search for better ideas,” he said. * The Ohio Farmland Preservation Office will hold a Farmland Preservation Technical Meeting and Local Sponsor Certification Presentation on Wednesday, September 09, 2015, from 10:00 am – 12:30 pm at the Ohio Department of Agriculture, 8995 East Main Street, Bromfield Building, Auditorium A & B, Reynoldsburg, Ohio 43068. The purpose of the meeting is to review with local sponsors the Clean Ohio 2015 Local Agricultural Easement Purchase Program (LAEPP) and 2016 LAEPP Local Sponsor Certification application. * The Ohio Farmland Preservation Advisory Board will meet Wednesday, November 18, 2015, from 10:00 am – 12:30 pm at the Ohio Department of Agriculture, 8995 East Main Street, Bromfield Building, Room 308, Reynoldsburg, Ohio 43068. The purpose of the meeting is to recommend local sponsor certifications and allocations for 2016, discuss the Clean Ohio 2016 Local Agricultural Easement Purchase Program and any other issues brought before the board. * The Ohio Farmland Preservation Office will be hosting the Farmland Preservation Certified Local Sponsor Training on Wednesday, December 02, 2015 from 10:00 am – 1:00 pm at the Ohio Department of Agriculture, 8995 East Main Street, Plant Health Conference Room, Reynoldsburg, Ohio 43068. Local sponsors are invited to attend. The purpose of the meeting is to discuss the Clean Ohio Local Agricultural Easement Purchase Program (LAEPP) with local sponsors and provide training on the 2016 LAEPP landowner application.